One of Segregation’s main premises (first outlined on p. 11) is that urban residential segregation is a tool of power. How does this tool work? 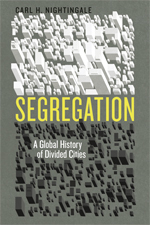 By dividing the city into separate racial zones, urban segregationists interpose four things– physical distance, physical obstacles, legal obstacles, and human beings (often armed) empowered to enforce the legal obstacles–between the areas where people of color reside and the areas of the city where opportunities for income, wealth, recreation, and health are concentrated. Residential segregationists, in other words, rely on the fact that in all of the world’s cities, geography is destiny—one’s location in urban space to a great extent determines one’s life chances. The physical and legal barriers segregationists place within urban space help to weaken the geographical position occupied by people of color and thus further undermine their likely life chances. In turn, segregationists design these spatial obstacles to intensify other non-spatial forms of forms of discrimination, such as discrimination in employment, in union membership, in access to education, food, health care, and government benefits of many other sorts, in access to wealth, and in access to the vote and representation in government. Geographic concentration and segregation of people of color can also make it easier for governments to engage in discriminatory acts of armed repression, including by the police, the criminal justice system, and armies. Finally, on the flip side, segregation allows whites—as the most powerful urban race-segregationists historically called themselves—to hoard urban resources and power for themselves, to shield themselves from repression, and sometimes even to shield themselves from any knowledge of the racial injustices that undergird their life of comparative privilege. In real life, using segregation as a tool of power involves many paradoxes. The most important is that while segregation allows segregationists to extend their power, it also forces them to expend power. To put spatial barriers in place, segregationists need to use other non-spatial forms of power. This is because no system of segregation has ever been put into place without opposition from people whose life chances are being diminished by segregation. To accomplish the difficult task of splitting a city, segregationists need give up some of their political capital, or pay dearly for the deployment of armed force, or invest the resources necessary to build systems of labor control and exploitation, or to put discriminatory voting systems in place, or to fight for power within the world of ideas, or to arouse white-led grassroots social movements, or to support systems of proprietary access to money, finance capital, and landed property. Faced with these costs, segregationists have to make a strategic calculation that all the trouble of splitting a city is worth it—that expending the power necessary will give them more power than they had before. This calculation essentially involves a test of whites’ faith in segregation, and it is a main reason why conflicts can arise within white urban communities and their institutions. In both South Africa and the United States, where segregation took especially radical forms, such internal conflicts may have been—paradoxically—essential to the success of urban color lines. Walls, palisades, battlements, bastions, fences, gates, guard shacks, checkpoints, booms, railroad tracks, highways, tunnels, rivers, inlets, mountainsides and ridges, buffer zones, free-fire zones, demilitarized zones, cordon sanitaires, screens of trees, road blocks, violent mobs, terrorism, the police, armies, curfews, quarantines, pass laws, labor compounds, building clearances, forced removals, restrictive covenants, zoning ordinances, racial steering practices, race-infused economic incentives, segregated private and public housing developments, exclusive residential compounds, gated communities, separate municipal governments and fiscal systems, discriminatory access to land ownership and credit, and complementary systems of rural holding zones, influx control laws, and restrictions against overseas immigration.